Celebrate America and Save your Change with 3D Coin Art! This is a FUN sponsored conversation about coin gifts from the folks at NSI International Inc. Opinions are my own. My boys have been collecting coins since they were very little. They have rolls and rolls of pennies, sometimes to the point that they are all over the house. 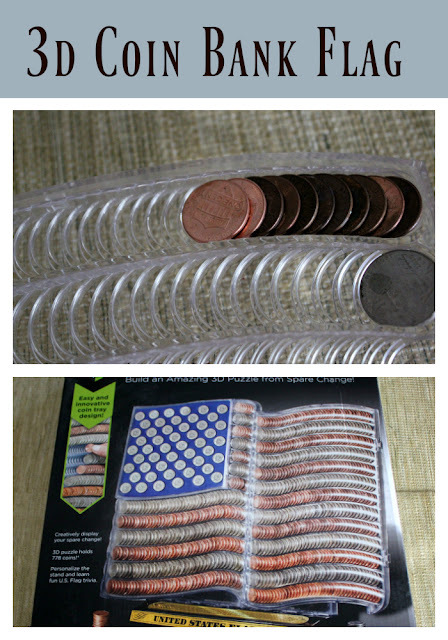 We were asked to review the 3D Coin Art United Stated Flag, and I knew that it would be perfect for storing and organizing their pennies, nickels, and dimes. Since they are also big fans of all things Americana, this flag was the perfect model! The puzzle is ready to go right out of the box. The instructions are super easy. I would recommend that an adult set it up initially, both by pulling apart the sides of the plastic case, and also by placing the stickers on the display stand. Once it's open, you can start filling it with coins! The instructions do ask that you have your coins ready to go, so this project is best done all at once. They include a sorting and counting tray to ensure that you have the right number of each coin before you begin. Putting the coins in was super fun! I could see this as a relaxing way to sort and store your coins. It's important to note that some coins won't fit perfectly, however, likely do to wear or gunky build-up. We only ran into this issue once or twice when filling our coin art, however. If you find a coin that doesn't fit, just set it aside and use another in its place. Provided you had all the coins ready to go, this entire project could be done in under an hour. The slots for the coins are easy to fill, and everything lines up so nicely! I wouldn't hesitate for this to be done with a child as young as 8. It's perfect for anyone who loves coins and would make an excellent gift! I can't imagine a more creative way to store and display $25! Learn more about all of the designs from the 3D Coin Art line at their website.